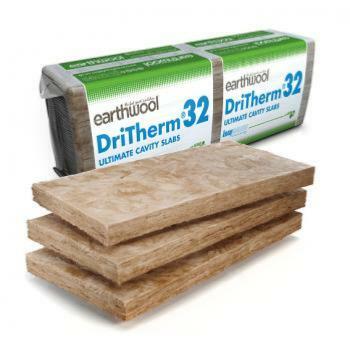 Earthwool DriTherm Cavity Slabs are semi-rigid slabs of non-combustible, water repellent, glass mineral wool. They are 455mm wide to suit standard vertical wall tie spacings, ensuring a closed joint with adjacent slabs. Supplied here in 100mm thickness covering an area of 3.28m2 per pack.